Want to have some great online casino fun? Drop by the birthday party at Energy Casino and join in the celebration of the return of online casino games players’ favourite explorer in the Gonzo’s Quest Slot, after a 5-year absence! In the tournament, aim to become a top player and win anything from a brand new iPod Nano, a Kindle Paperwhite 2 or a Bluetooth Speaker as well as part of the prize money of EUR 225. There are other gifts galore waiting at the bottom of the treasure chest. Drink from one of the Gonzo’s Quest’s branded birthday mugs that will be handed out to some of you lucky contestants! 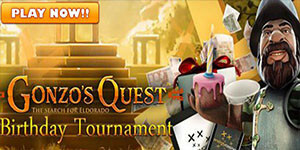 Read here: Energy Casino Calls You to Celebrate in the Gonzo’s Quest Birthday Tournament .